There’s more to Lent than Lent Madness. But before we get to that, we have results to share. Yesterday, in the Slavic Smackdown®, Methodius easily bested his brother Cyril (65% to 35%). He’ll be stepping into the Lent Dome with the winner of Lawrence vs. Albert Schweitzer in the round of the Saintly Sixteen. Some of the discussion got a bit heated as people variously protested that it wasn’t fair to pit two brothers against each other and that they should have been allowed to compete as a pair. In response, the Supreme Executive Committee has shared the Ten Commandments of Lent Madness for your reading pleasure. Feel free to chant them this morning in church. In any case, you may know that Lent Madness is sponsored by Forward Movement, a ministry devoted to inspiring disciples and empowering evangelists. Lent is prime time for the work of discipleship, so we wanted to share some other resources with you. If you’re looking for a way to enrich your Lenten journey further, perhaps one of these resources will be useful. Some are free, some have a very modest cost. Grow Christians is the brainchild of the Rev. Nurya Parish (who keeps an excellent blog called Churchwork) offered in partnership between Plainsong Farm and Forward Movement. Grow Christians is an online community of discipleship focused on the practical details of life at home. Gathering reflections, stories, images and recipes, this group blog inspires generations to come together as they celebrate the presence of God through the Christian year. 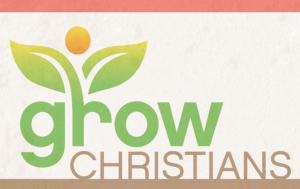 Grow Christians is a pilot project for Lent 2016. It is a temporary project on purpose, because a major intergenerational effort like this needs reflection from the whole church. Check it out at www.growchristians.org. Where do you meet Jesus? In the Gospel of Matthew, Jesus urges us to feed the hungry, clothe the naked, welcome the stranger, and visit the prisoners. And in doing so, we meet Jesus. These daily reflections for Lent, offered by well-known faith leaders, provide boots-on-the-ground stories of serving and being served by “the least of these.” The meditations also explore our own hunger, our vulnerabilities, and the times we are imprisoned, either self-imposed or by circumstance. Come and meet Jesus each day this blessed Lenten season. Contributors include Mike Kinman, Becca Stevens, Allison Duvall, Bo Cox, Hugo Olaiz, Lee Anne Reat, and Richelle Thompson. You can buy this small book in paper or for Amazon Kindle, Barnes & Noble Nook, or Apple iTunes. 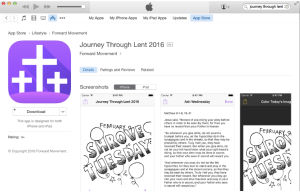 The app, Journey Through Lent 2016, brings Forward Movement’s popular Join the Journey Through Lent daily coloring calendar to the digital world. The app provides daily images and reflections illustrated by award-winning cartoonist Jay Sidebotham, offered alongside daily Eucharistic gospel readings, a space for journaling, and the option to add color and share your images. Available for iPhone or iPad. This Lent, explore ways to recover and renew economic imagination with daily reflections, videos, and other resources. 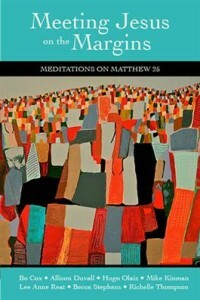 Produced by the Theology Committee of the Episcopal Church’s House of Bishops in partnership with Forward Movement, Repairing the Breach: Discipleship and Mission in a Global Economy examines the causes of economic injustice and our role, both personally and corporately, in unsustainable patterns of consumption and self-interest. The project also highlights specific practices where the Spirit of God is moving in local congregations and communities to bring new life. Check it out at http://repairingthebreach.forwardmovement.org. Check out the full array of resources for Lent and Easter on the Forward Movement website. 21 Comments to "Lent Beyond the Madness"
How do I find results from previous days? Once I’ve voted, that seems to be it until you announce the winners the next day. Of course, I guess I could just keep all those emails…duh…didn’t think of that! And re my comment on the brothers…I was making it in fun–didn’t mean it to sound snarky. Next time I’ll add an emoji! Grace, you can find results in two places: in the sidebar, there are 5 of the most recent posts under “Recent Posts”. But they put all of the results on the page “Bracket 2016” in the menu at the top of the page. Click that, then scroll down below the 2016 bracket, and you’ll see the results, linked back to their resprective pages. And all of these wonders are at http://www.lentmadness.com! Why isn’t the “Journey through Lent” app on Android? I am feeling let down and deprived. I’ve got to agree…. and how about Windows 10 phones, of which I am an owner?? Seems we’ve left a large audience out in the cold. Our terrific volunteer programmer only works with Apple iOS. If you want to create an Android app to be offered through Forward Movement, let us know! In regard to the Android question, I’ve got to wonder if there isn’t another volunteer in the arena that has the necessary expertise to provide for those of us that don’t use Apple products. I think you’re short-serving a rather considerable potential audience in providing only for one user, despite the use of voluntary labor. There’s got to be someone in your talent pool who could fill the gap and not leave all of us out of what sounds like a fun application. This young man (aged 14!) approached us, and he’s been brilliant. We are all ears, if you have someone in mind. Thanks, Scott. I don’t have anyone in mind, partly because I know nothing of the parameters under which they’d have to function. I’ll ask around here (Northwest Oregon) and see what I can learn. Maybe I can help with some education. Feb. 13 had ‘go vote now’ in text. Feb. 14 does not have a clue where to go vote. What to do? There is no vote today or on any Sunday. Yesterday was the only Saturday in Lent in which there was a vote; for the rest of the time it’s just weekdays. Voting resumes tomorrow at 8:00 a.m. EST. As others said, yesterday was the only Saturday vote. After this, you’ll be struggling with Lent Madness Withdrawal over the weekends with no voting. Tune in tomorrow morning to cast your next vote! Well. good morning! I really don’t have a thing about which to write…..I just like to add my 2 cents and comment on strange opinions from other folk. I’m going to a Valentine luncheon in the early afternoon and a church member will pick me up….that means to give me a ride in her car for non-Southerners who think she’s going to bodily lift me up and haul me somewhere. That will be her Lenten contribution for today and mine will be accepting it without complaining since I can’t drive anymore. It’s hard being gracious and un-grumpy…..really! Good Bloggers for the brothers..disregard complaints. Aleathia, I love reading your posts. You keep on going girl! I hope that when I’m older (I’m quite solidly middle-aged now), I will have the grace to accept help where offered, and that I will still be mentally as sharp as you! BTW up here in MI we say ‘pick up’ as well. I loved the comments yesterday and I think the SEC realizes that most were in fun, but now that the Archbishops aren’t doing color commentary they have to do something to stir up the masses! Where is location of ‘vote now’ ? I’ve looked everywhere. See my comment in your earlier comment above. There’s no vote today…. The more I thought about yesterday’s matchup between two brothers, I realize that maybe I over-reacted. I understand when people were bothered by two siblings set against each other. I understand the difficulty in voting for one over the other. But maybe it was a good thing in the long run for these brothers. If they had been put up together against another saint, they could both have been eliminated. By separating them and “pitting them against each other,” one would definitely move on and continue to inform us lowly people more about their ministry. I didn’t need the Ten Commandments. I just needed some time to reflect away from the comments that seemed to indicate displeasure at the SEC. In the separation, in a way, both live on to continue their story this Lent. I enjoyed the sibling “contest.” Cyril and Methodius might have liked it, too, because so often they are referred to in the same breath as if they had one name: CyrilMethodius. Who would have thought that Lent Madness would have had the bonus blessing of individuation for the brothers that have been denied them lo these many centuries? With Lent Madness many things are possible.